A tropical depression swirling in the Central Pacific may soon become a tropical storm, and it could make landfall in Hawaii. According to the Central Pacific Hurricane Center in Honolulu, tropical depression Kilo might once again become a tropical storm, as early as Sunday. The hurricane center says Kilo could regain strength, becoming a tropical storm by Sunday night and a hurricane by Thursday. It is supposed to take a northward turn, and the timing of the turn will determine how much of a threat it is to Kauai and Oahu, according to forecasters. “There is considerable uncertainty as to where this system will make its turn toward the north, so people in Hawaii should continue to pay attention to the forecast and be ready for any changes over the next few days,” Robert Ballard of the National Weather Service and the hurricane center told Hawaii News Now. But it is still unclear whether Kilo will develop into a hurricane. Forecasters at the Central Pacific Hurricane Center noted that the predictions may be irrelevant if the storm doesn’t develop deep convection near its center. A turn to the northwest is expected with a more significant decrease in forward speed through Monday. 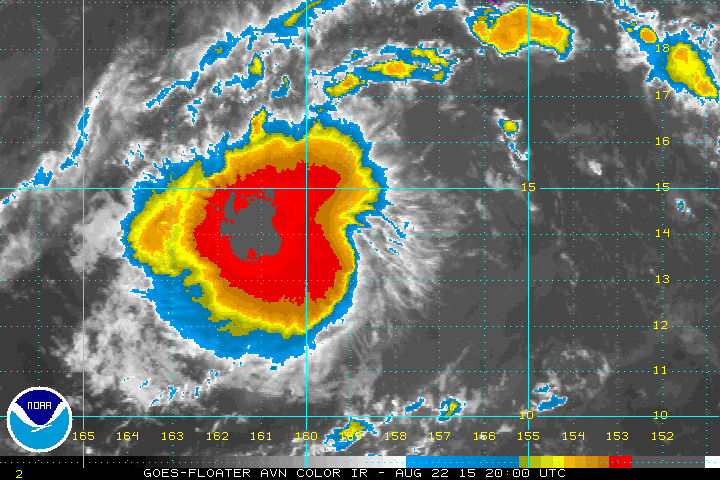 Kilo is expected to gradually strengthen over the next couple of days, forecasters said. Radar imagery for tropical Depression Kilo shows the storm and the rain associated with its bands of moisture. AccuWeather meteorologists believe that the system will track to the west-northwest through the weekend before making a northeastward turn next week. The Honolulu Star Advertiser reports that, at 5 a.m. Sunday, Kilo was about 570 miles southwest of Honolulu and moving west at about 15 mph. Maximum sustained winds were 35 mph with higher gusts. Forecasters say its motion is expected to continue for the next 24 hours with some decrease in forward speed. Depending on if Kilo continues that northeastward track or slows/stalls before curving back to the west later next week will determine whether or not significant impacts of flooding rain, damaging winds and coastal flooding reach Ni‘ihau, Kaua‘i and Oahu. According to AccuWeather, ahead of any significant impacts to Hawaii, surf will build along the south-facing shoreline of the islands into early next week. Small craft operators should pay particular attention to the system. Except for the east-facing slopes of the islands, much of the island chain could stand a thorough soaking, shy of flooding rainfall. Gov. David Ige signed an emergency proclamation Friday making the state’s Major Disaster Fund available for disaster relief should Kilo make landfall in Hawaii. Tropical Depression Kilo could impact travel plans for visitors, so check with airlines prior to any planned flights next week. Visitors should also read the Hawaii Tourism Authority’s Travel Safety Brochure at travelsmarthawaii.com.